"The Host takes over their mind and lay eggs on their body. It's gaping mouth protruding from the mans stomach allows for the parasite to quickly consume food and nourish it's eggs. Tumors begin to bubble over the body attempting to store energy for the eggs for days when food is scarce. The mans body becomes an empty vessel slowly decaying away as the eggs mature and get ready to feast on what's left of the host. Beware this creature when it leaves at night to feast." 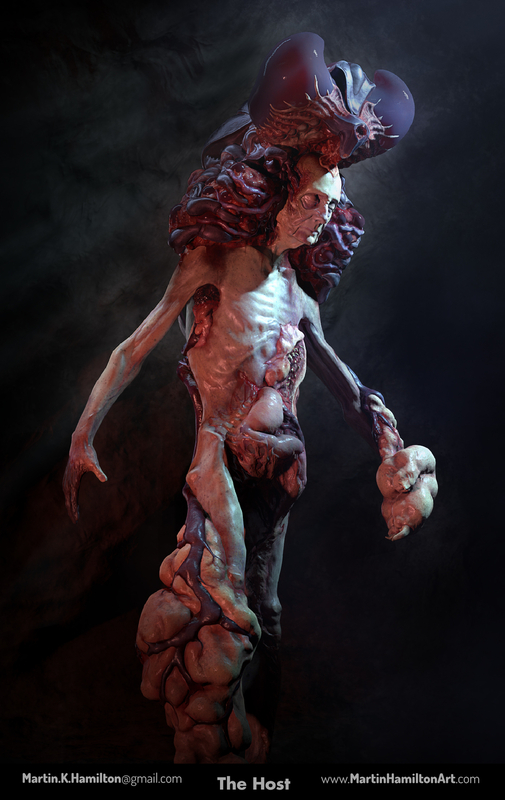 This is the creature I made for Jason Martin's Creature class. I had a great time in class and learned a lot. I pushed myself to get a really well rounded character with great detailing in both the sculpting and texturing. Switched from a metalness/roughness workflow to a specular/gloss workflow and really enjoy the control specular channels give you. Thanks to everyone who helped and supported me along the way of this project.